I loved the Jesus Trail. It was really hard physically and at times I wanted nothing more than to fall over and stay down. When we sat down for lunch or at ruins, it was so hard to stand up. It was more physically draining than anything I’ve ever done. But the spiritual renewal was incredible. First of all, I had no idea my body was capable of that. God truly does amazing things. He has created incredible beings and he gives us amazing strength we don’t know of. I don’t think I’ve ever felt as empowered as I did on the trail. Ever. God is great! Second, I have a spiritual connection to the Galilee now. It’s not because Jesus walked there. It’s because I walked there. This drew me closer to Jesus not because I felt his presence, but because I connected to the same land he connected to. We love the same hills. We walked the same-ish paths. We ate the same-ish things. And we took shelter in the same-ish places. I’m sure he was just as relieved to reach Cana at the end of his journey as I was that first day. I feel like my friend shared something they love with me, and we are closer for it. Visiting Nazareth Village and staying in Fauzi Azar Inn with all of its stone arches and beautiful painted ceilings. Visiting the Synagogue in Migdal, the town which is the birthplace of Mary Magdalene and the most verifiable location of a place where Jesus actually sat and talked about the Torah. Staying overnight at the organic, vegan Yarok Oz Goat Farm. We spent a night there and it was peaceful and quiet and the food was amazing!! 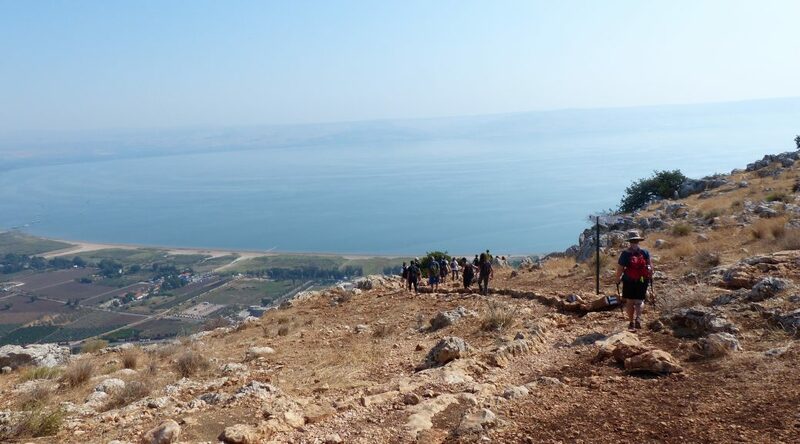 Besides the vast beauty of the area we hiked in, our guide also added to our experience on the Jesus Trail. He was a twenty-eight-year-old Israeli who had decided to take the path less traveled by not going to university after his military service. Instead, he decided to travel and become a tour guide, and in my eyes, a pretty good one. When we first met our guide he told us that he was a secular Jew. I know, a secular Jew teaching us about where Jesus walked? He did an amazing job respecting Christianity regardless. Our guide was an interesting guy to hang out with and talk to as well, even when some of the conversations had to do with the conflict. After he was brought up to speed on our dual narrative trip, he was very open and honest about his point of view on this conflict. He was also willing to listen when an idea that he didn’t exactly agree with came up. Hey, I know you, how are you? Oh, I’m doing well, how about you? From taxi drivers: Where are you going? Want to go to Jericho? Hebron? Dead Sea? Tel Aviv? Beit Sahour? Beit Jala? The Nativity? The last one is usually when I am about 1/4 mile from the Church of the Nativity. I don’t know where they wanted to take me or how, but my backpack and white skin immediately identifies me as a “lost tourist” no matter what I am doing. The list goes on. Slowly, we stopped jumping in shock at the sound of honking and learned that the person is most likely not angry and is just driving behind us on the cramped street and wants to let us know they are coming through. When this happens, we casually move closer to the wall, praying there is enough room for the person to scrape by without hitting us. The nuance of a car horn really is amazing. I think we have deciphered the message within the length and number of honks—so we are really learning three languages here—Arabic, Hebrew, and car! The only one that still really bugs me is the long, blaring honk in stopped traffic. We get it, you are not moving . . . but continuing to hold down the horn for twenty seconds isn’t helping you move either! On the morning of October 2nd, our group drove from Bethlehem to the Bedouin village of Um Al-Khair, unrecognized by the Israeli government. An unrecognized village receives no services, meaning no connection to water, electricity, or sewers. As we approached the village from the main road, the contrast with the settlement next door was astonishing. Um Al Khair is a small village with pieced-together houses of scrap metal, wood, and plastic, while the settlement of Carmel has nice houses, green grass, street lights, and running water. We were in Um Al Khair to help tend their olive trees and learn about how and why the Israeli government has issued demolition orders on their homes. Why aren’t more people using THESE alternative energy sources? Throughout our time at Kibbutz K’tura the group has listened to several lectures and participated in a variety of Kibbutz activities. Perhaps the most memorable for me was the visit to K’tura’s “Off the Grid” village. 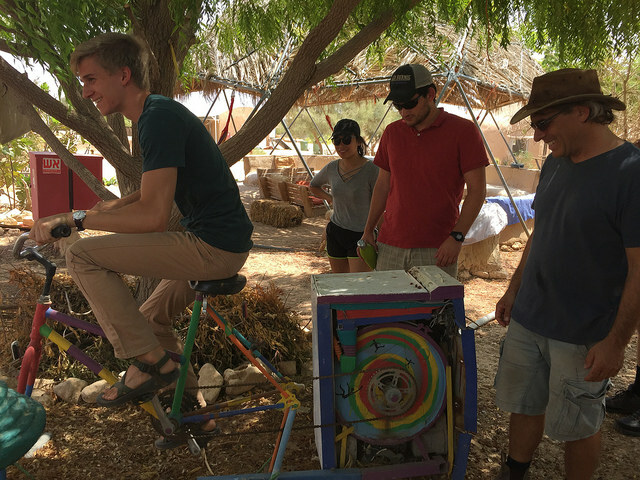 As an initiative stemming from the strong emphasis on environmentalism and research, Kibbutz K’tura has created a village to simulate various possible “off the grid” devices. We began the session discussing the three stipulations that categorize any location as “off the grid”: No connection to state-provided water, sewage, and electricity. Of course these three resources are essential to a healthy life and instead of focusing on living without water, sewage and electricity, the village provides innovative ways to provide the three conditions through inexpensive, renewable energy sources that do not need to be connected to any national system. We began in the village garden which receives water from a well attached to a portable solar panel pump sending water up to a retention basin (giant bucket) three feet off the ground. The portable solar panel pump was designed by Engineers Without Borders to ensure mobility and efficiency at a low cost. The garden uses a low-pressure drip system to trickle water out slowly but constantly. In order to truly be considered “off the grid”, the village would need to be equipped with composting toilets to eliminate any sort of sewage system. Unfortunately, K’tura’s village does not have any restroom accommodations, however, they currently have a solar-powered water filtration system to ensure the recycling of water for continued use. Our guide pointed out what looked like a satellite dish pointing up towards the sky. Water is pumped into this dish and pushed through filter pipes that are heated from the sun. The process distills the water so purely that the water actually needs to be re-salinated and mineralized before being used on crops or it will actually pull salt from the ground and ruin the crops. Unfortunately, because of where the Arava desert sits on the sun-radiation scale, this water purification system can only be used during the winter months because the dish gets so hot that it would melt the metal pipes that carry the water through the purification process. However, in most other parts of the world (where it isn’t 114° Fahrenheit in the summer) the system would be able to work year round. Next we toured three different “huts” built to represent varying climate conditions and needs around the world. We began in a wooden structure fitted with one solar panel to provide electricity for light, phone/computer power, and a fan. The most interesting feature was a solar oven. In several pictures you can see what looks like black lights but instead are double walled glass tubes with vacuum space in between and a tube of black aluminum in the center. The sun comes in as light and goes through the first layer of glass, the vacuum, the second layer of glass and then gets turned into heat when it reaches the black aluminum. The heat, which cannot travel through vacuum space, remains on the inside of the glass and creates a miniature oven inside the tube. Although it is small and would require lots of time to cook a complete meal, the ingenuity is incredible. The oven can heat to 300° C in full sun, and was deemed fully functional by EMU students after testing its power by baking coconut cookies (see photos). There were two other notable gadgets; the first were sky lights made from filled water bottles inserted into the roof. Second, a compost bin used water and organic materials to create methane. Patented under the name “HomeBioGas”, this system is noteworthy because it can be taken to any place where people will have organic waste, and the methane can be used as a free source of cooking gas. Places struck by a natural disaster or facing large quantities of refugees could benefit immensely from having essentially free cooking gas that does not necessitate continual use of wood or coal or other polluting burnables. It was refreshing and inspiring to spend some time exploring the gadgets that are being created in response to our unstable resource bank and surroundings that bend to nature. After three days discussing environmental degradation and resource depletion, it was fun and comforting to eat cookies baked by the sun while brainstorming ways that we as humans can adjust our habits to use less while still enjoying life and community. It has been challenging on this trip to not grow weary from negativity and burgeoning awareness of the complicated issues that face the Middle East and the world. Day after day of peacebuilding lectures can be overwhelming, however, visiting the off-grid village put my heart at ease knowing that there is still good in the world. It was a reminder that every step I take as an individual makes an impact, and perhaps with continued awareness, the efforts of another individual will become the efforts of many and the results will be evidenced through a lesser need of violence and conflict in our world. It was over 100 degrees at 5pm when we began our hike up the rocky Kasui Mountains. If it weren’t for water/sweat evaporating so quickly, we would have been drenched before we reached the top. After the 15-20 minute hike to the top, we were greeted by shade, breathtaking views and very soft sand. 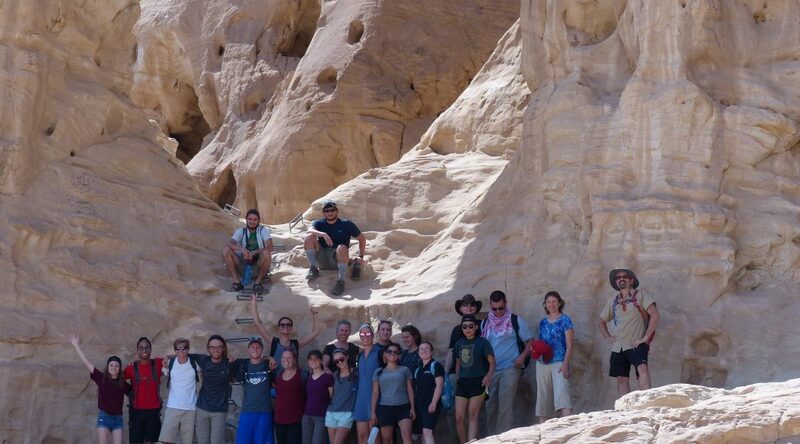 We received a short explanation of the mountains, the sand and “spirituality in the desert” from Sara Cohen of Kibburz K’tura. She gave us time to run, roll, jump, etc. in the sand, up and down the dune. After our “play”, she requested that we go to a nearby spot, away from another member in our group, and sit in silence, listening to the sounds of the desert and thinking about why it has called so many prophets. Then we wrote down our thoughts and feelings of those moments. Being from the tropics (Florida) I’d never experienced an extreme desert environment, much less “spirituality in the desert”. As I chose my spot at the top of the mountain I couldn’t help but notice God in every bit of the land and sky — the beautiful pallet of colors as the sun set, the change in color of the mountains, the howl of the wind as it made sand waves on the dunes (and covered us and our belongings in sand), the shapes of my friends as they took it all in too. And most important, the serenity in the midst of it all. When we finished, we gathered under the stars for a dinner of freshly baked pita bread, hummus, veggies, and falafel. When our bellies were full we split into two smaller groups and shared our experiences. Some wrote poems about the landscape, others talked about their thoughts, some reflected on their past and families, and a few discussed their time with God. 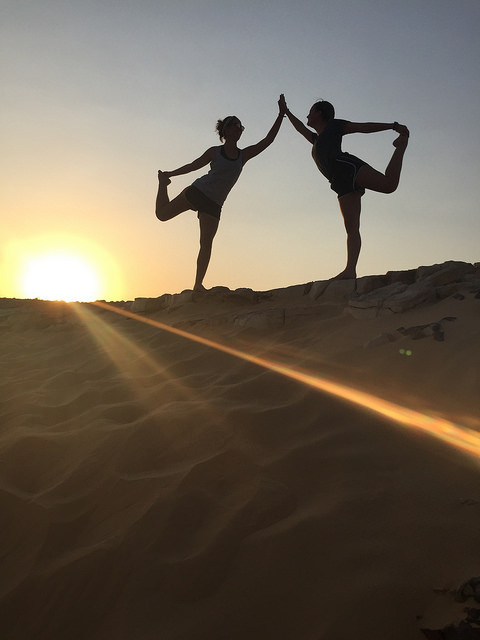 I think we would all agree that this time in the desert has been one of the highlights of our trip so far, and something we won’t forget for a long time to come. Regardless of where each of us are on our spiritual journey, there surely is something to be said about the desert and what comes from it. I am here; roaring, flying, dancing, wandering—thriving. We will pack the experiences from Kibbutz K’tura and carry all that we learned here about Zionism, Judaism and the environment. Next, our travels continue four hours north to Bethlehem, Palestine. Inshallah, we will not forget our Hebrew as we switch our studies to Arabic! 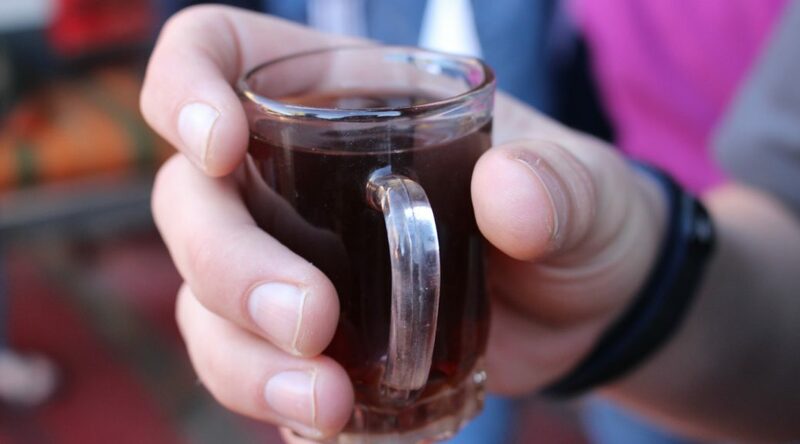 Our group will be divided to live with ten different Palestinian-Arab Christian and Muslim families throughout the city. Onward in the Holy Land! Expect to hear from us relatively soon. Shalom. Salaam. Hu is He, He is She! Hello from the Negev Desert! It’s hot. Last week it was 100 degrees at 8:00pm and they told us “a heat wave is coming”. It got up to 114° two days later… a bit much for a Kansas girl. Bleary-eyed and exhausted from the first four days exploring Tel Aviv, Jaffa, Haifa, Akko, and Jericho, our group stumbled out of our bus onto Kibbutz K’tura on Wednesday, September 6th. We were greeted with fresh fruit AND cold water! Glory be! We had been going almost nonstop since the moment we put our feet on the ground in Tel Aviv, then five days ago (now 20+ days ago when I’m writing this). This place, at first glance, appeared to be a place of rest and refuge, an actual oasis in a desert, a body of green and trees after a long drive through arid, sandy mountains and flatlands. To answer your first question: what is a Kibbutz? Originally, a Kibbutz was set up as an intentionally socialist society. All of the income from the members of the Kibbutz (whether working on Kibbutz or off) goes into one pile o’ cash. 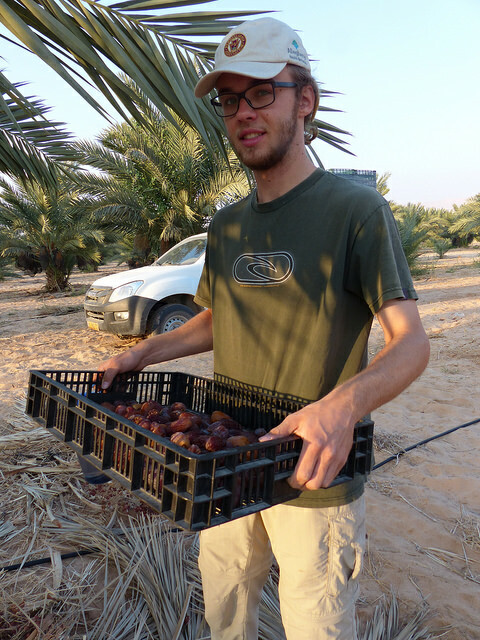 No job is more important than the next (Head of Kibbutz gets paid the same as the date picker). They eat in a common cafeteria, their kids go to the same school and originally slept away from their parents in “children’s houses” (sharing common caregivers so the parents could work more). Cars are shared between all members of the Kibbutz (20 cars for 200+ adults), etc., etc., etc. These Marxist influences made their way to the desert via European Jews making their “Aliyah” to Israel (fulfilling their birthright to return to the land that was promised to the Jews by God in the Bible). Jews emigrated to Israel from far and wide who were passionate, imaginative, incredibly dedicated to being Jewish, and, in my humble opinion, a tad bit crazy. They came with practically nothing and decided to settle in a desert. Just to give you an idea of the heat, it’s nearing the end of September and we’re lucky if the temperature doesn’t spike over 100° F every day. Luckily, they have a pool! There are many incredible stories about each individual Kibbutz and how it specifically was started, but we mainly heard the stories of three Kibbutzim: K’tura, Yahel, and Lotan. First and foremost, K’tura. This lovely Kibbutz has been our home base and is the host of the Arava Institute for Environmental Studies, where we have been studying for the past two and a half weeks. We are all so incredibly grateful for their wonderful hospitality. Many groups only stay here for a couple of days, maybe a week. Some just stay for a meal and a tour of the off-grid village (more on that in Adrienne’s post). Shalom! Here we are in Tel Aviv, Israel. Our feet have carried us for 29 hours in this exotic city. My first impressions of this land: The sand is hot, the sun brilliant, the skin leather. I feel as if our foreign presence is obvious. We walk around dripping with sweat like everyone else and we squint from the overbearing light – just like everyone else – but the lingering stares from the locals feel heavy (I think it is because of our Chacos, water bottles, and backpacks!). Now, I hesitated to substitute the word “locals” with “natives” because of Israel’s distinct and complicated history. In Tel Aviv, it is different because every religion, style of dress and language is welcomed with open arms. However, the Israeli-Palestinian conflict is ever-present. To put it simply (and pleasantly), Arabs lost their homes when the Jews arrived, yet the Jews fulfilled their prophecy to acquire the Holy Land. There seems to be a silent tension when the conflict is discussed from a one-sided perspective. I have been feeling as if the people that speak to us about their opinions are not spilling all that lies on their hearts. Instead of being open minded, it seems to me that most people we have encountered maintain their stagnant, silent attitude and avoid discomfort at all costs. When our group walked down the coast to Jaffa – a one hour walk south of Tel Aviv – it felt like were the only people in the streets. Our guides, Elad (Moroccan Jewish) and Alaa (Palestinian, Israeli citizen and a graduate of EMU’s Center for Justice and Peacebuilding program), explained in a careful tongue that Old Jaffa holds burdensome Arab Palestinian history, which entails a negative connotation for the Jewish Israelis. Despite this, most Palestinian homes in Old Jaffa have been repurposed into boutiques that overflow with vivid paintings, jewelry, spices, and napping street-cats. It hurts me to know what happened to the Palestinians who used to call these places home. Even in the most shadowed corners of Old Jaffa, the winding stone walls still prove capable of absorbing the brilliant heat. It is a port town, aging close to 5,000 years. Each stone path is chipped with biblical history. On our first full day in Israel, our feet have carried us across sand where the disciples once walked. We have waded in warm Mediterranean waves, stuttered our newly-learned languages of Hebrew and Arabic, and seen the house of Simon the Tanner where Peter slept after he raised Tabitha from the dead, and where he had a vision from God commanding him that “what God has cleansed you must not call common” (Acts 10:15). Our feet ache with heartbeats of a new adventure, and our mouths still fall agape at the sight of this beautiful land. I feel overwhelmed with this unfamiliar place, its deep internal conflict, the languages, and the stares. I do not have much to say about our first week in Israel. My mind, however, proves opposite of my mouth. It has become feral like the Israeli street cats – constantly stirring and pulling up emotional garbage – and I can’t seem to twist my thoughts into comprehensible words. Regardless, I have an immense hope for the good that could come from this diverse desert. The friendships I am forming hold a sense of genuineness I have rarely felt before. I will move onward, Insha’Allah (Arabic for “if Allah allows” or “God willing”) to tomorrow, where our feet will further carry us in the Holy Land. Walking through the streets of Tel Aviv we hear a different narrative from the day before. 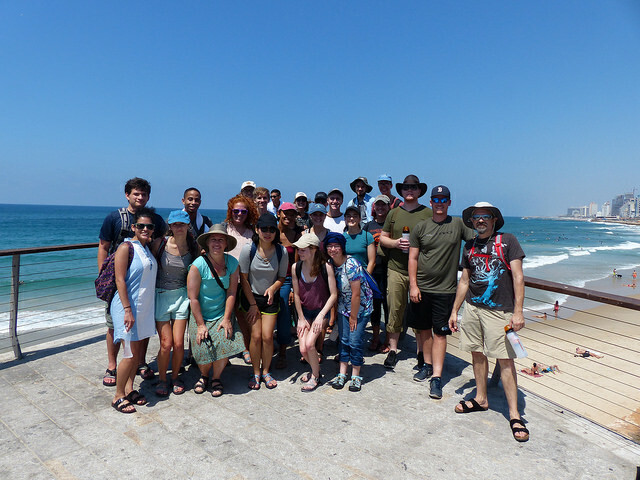 Our guide, Abraham Silver, a long-time resident of Israel with American Jewish roots presents the story of a youthful city with a history of only 107 years, started mainly by people in their teens and low 20s. Yes, 60 families, mostly made up of people our age helped to build the first Jewish city in what would become Israel. Abraham shows us a picture of the families, on a sand dune, with a barren landscape behind them, waiting to be tamed. Walking through Tel Aviv we look up into glass buildings that reach new heights. We walk on sidewalks that cover old sand dunes. The “New York of Israel” is a success story woven with the pain and fear of a thousand years of living in ghettos and fleeing pogroms. We feel the effects of massacres in Rome, Spain, Kishinev (Google it), and across Europe. All is cross-stitched with the bravery, imagination, and the stubborn (blind) determination only present in teenagers. Israel was founded by young adults with nothing to lose. Moving to the U.S. would have been the responsible choice, with job opportunities, family, and pre-existing, thriving Jewish communities. Israel was the dreamer’s choice. The end result is a victorious fairy tale that overshadows all else. Our guide stood in the center of Neve Tsedek, the first neighborhood of Tel Aviv, proudly singing the song of a found people. The tale continues to be one success after another. We see the houses where the founders of the modern Hebrew language took a biblical tongue not spoken for more than prayers in 400 years and developed a colloquial language so that the eventual nation (already dreamed of by this time) could have its own language. We stand in the middle of a metropolitan sprawl looking at a tiny cappuccino kiosk, what had originally been the very first building of Tel Aviv. We sit in front of the first Jewish school for girls, one of many examples of the revolutionary Israelis. Finally, our guide tells us, “The Jews have a home. Finally, we are safe.” But there is a lot more to the story that we find out later. For instance, that picture of those first 60 families, standing on a sand dune, with nothing but empty space behind them. We later find out that had the photo panned to the left or the right we would have seen the Palestinian villages that already existed in this “empty land”. Who do we believe? How can we get the full story? That is what we are here to do. And it is hard work . . . if it is even possible. The contradictions continue as we learn about different types of peacebuilding efforts by Israelis and Palestinians and organizations made up of both. The Shimon Peres Institute for Peace and Innovation (started by Shimon Peres, former Prime Minister and President of Israel) swears that relationships are the keys to peace. But their building is built facing the seafront, blocking the view of Palestinians living behind it and very close to a Palestinian cemetery. 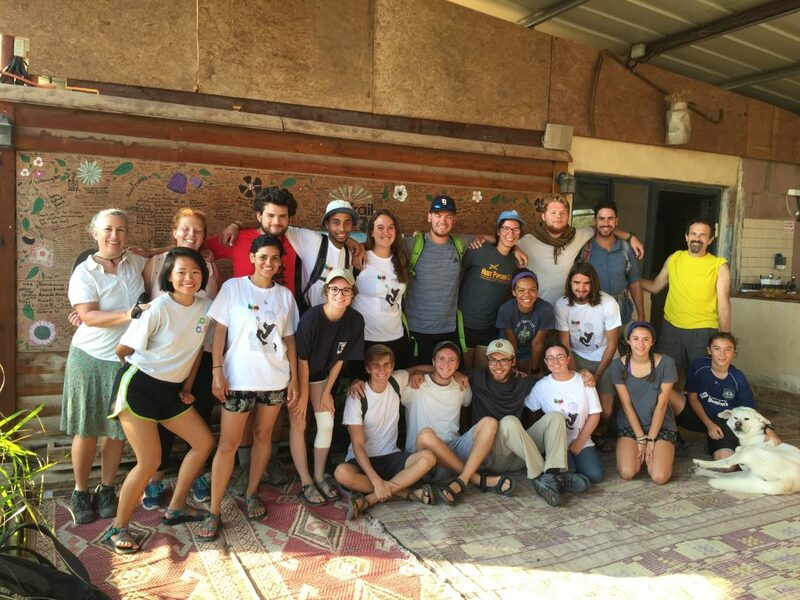 Zochrot, the second institution that we toured, vows that there cannot be peace without justice – allowing Palestinians the option of returning to the land they were forced to leave. They have created a map that shows the Palestinian villages emptied or destroyed in 1948 during the “Nakba” (Arabic for “catastrophe”) when Israel became a nation. The third institution we saw, Beit HaGafen, works with the shared humanity of art. Then we visited Jisr Az Zarqa, a poor Palestinian city in Israel, where recent development and tourism attempts show potential to bring better economic conditions to this town of 40,000 people. Next to this, we hold within us frustrations over the language barrier and the joys of having fun with friends. We are still college students learning what it means to live in this world. We are sleepy and excited, exhausted and rejuvenated. We have more questions than answers, more processing in the works, and we all share a deep sense of something. When we figure out what it is, we’ll let you know. 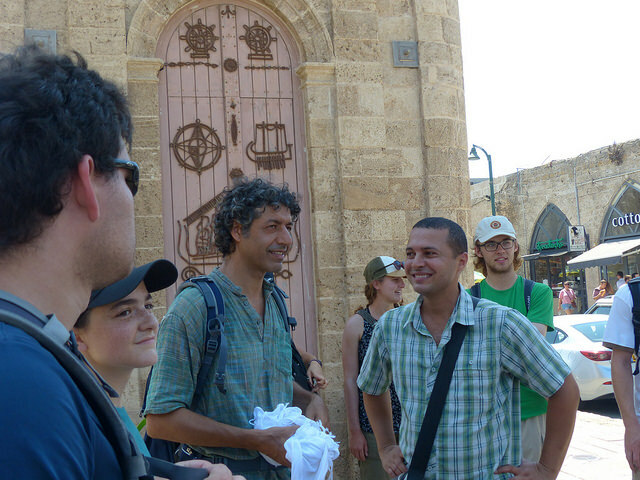 Tuesday night we said goodbye for a few weeks to our guide Alaa after a day’s tour of his home city of Akko. Wednesday morning we left Haifa on our faithful modern-chariot [bus with air conditioning] for the old and new city of Jericho. We pulled into a quiet gas station just outside of Jericho and if not for the signs being in Arabic and Hebrew and the presence of several camels, it would be hard to tell that we are not in the American Southwest. After refueling and picking up our new guide, a local man named Hamudi, we drive into Jericho. Before crossing into the city limits (which are controlled by the Palestinian Authority), we must first part ways with our Jewish guide, Elad,. Regardless of how badly we want him to accompany us and vice versa, it is illegal for him (and all other Israeli Jews) to enter Jericho, which is part of the Palestinian Authority known as “Area A” (for more information on who controls which part of the West Bank, click here). It is with heavy hearts that we must continue without these two guides, who have quickly become friends. This is one of the first tangible lessons of the conflict. Shortly after leaving Elad we get our first true glimpse of the “Palestinian State”.Jericho is a cluttered canvas splattered with shades of grey, beige, and off-white. In some places it looks like a public service announcement about the developing world and in others a modern city. One of the most obvious signs of tension between economic development and stagnation is an “Oasis Hotel” and a casino – a massive, beautiful, modern building with doors locked tight and only “guests” allowed to enter. Unsurprisingly, the potential for explosive conflict is bad for the once growing business and has driven away much of the casino’s former clients, providing an even more powerful reminder of the stranglehold Israel has on Palestinian territories. After a lunch of delicious shwarma (meat wrapped in a pita with various sauces and vegetables) or falafel (fried balls of chickpea and spices, wrapped in pita with various sauces and vegetables) we head to the tree that Zacchaeus the tax collector climbed to see Jesus as he passed by in Jericho. Today the tree is like so many other sites in the modern Holy Land – a tourist trap. A local vendor hawking his wares stopped to tell us the story before immediately returning to enticing us with scarves and trinkets. As thanks for the story, a few of us bought head scarves or other small items. I was personally pulled aside by a man selling dates and after some intense negotiation, I passed on his product which I knew was overpriced. I have to this point left out an essential character in our story, Ibrahim, our long suffering bus driver. Ibrahim is a man of few words, speaking only softly and seldom. Despite being quiet, his driving is anything but. After boarding the bus again, Ibrahim takes us to an overlook below the Mount of Temptation, and displays his skill behind the wheel that would make Mario Andretti blush. Through a combination of grit, determination, and what I’m certain were a few Arabic curse words, our bus makes its way slowly up the steep and winding gravel-strewn slope to the overlook of the valley. Above us built into the cliffs is a large monastery belonging to the Greek Orthodox Church. Below us spread out across the valley floor is a tapestry of brightly colored patches of garbage that looked as though the sun has melted a million boxes of crayons. As lovely as the image might sound, it was far from beautiful. The vibrant realization was that the source of color was just human-strewn trash. After a few minutes of melting ourselves in the sun, we boarded our bus and Ibrahim once again showed his talent on the way back down the mountain. Finally, we arrived at our last sight-seeing destination in Jericho: the archeological excavation of the old city of Jericho. It was at this moment my inner child (and inner Indiana Jones) was set loose. My joy, however, was short lived. Despite the ongoing excavation and restoration, the current site of Jericho is far from the lost cities and ancient temples Harrison Ford came upon. In part, this is due to the logistical challenges of excavating a place where temperatures typically exceed 100° Fahrenheit, electricity and water are spotty, and the conflict makes it difficult for archaeologists to get permission for new digs. I still found the walls and tower to be impressive, and the portions of the site that have been renovated are even more incredible when you consider that Jericho is more than 10,000 years old. Layer was built on top of layer, but the original stones and bricks that make up its early walls are easy to distinguish from the renovations. Whether or not the site is accurate to the biblical Jericho or whether the story of Joshua and his famous battle has any truth is up for debate but I found it to be undeniably awe-inspiring. The longer we spent walking the grounds of the site the more my initial disappointment faded. This was the remains of the ancient city of Jericho! While there was certainly nowhere to practice my Indiana-Jones-bullwhip-skills or hidden passages to explore (thanks to ropes and chains surrounding all excavation pits), my childhood dreams of seeing the wonders of the ancient world were rekindled. As we left the town behind us, I reflected more on what it was that made me fall in love with history in the first place. It wasn’t some vain idea of being a “world adventurer” it was the idea of seeing the places where people had lived their lives and to have the opportunity to walk in their footsteps, experiencing their holy places, and perhaps most importantly, meeting people like Hamudi who told their stories and kept their myths and legends alive. We read the Biblical stories of Jericho aloud as we headed to our next destination. It was a good closer for the experience. Hey Andy look at the cat! Uncle Bill, why can’t I put sunscreen on your back? 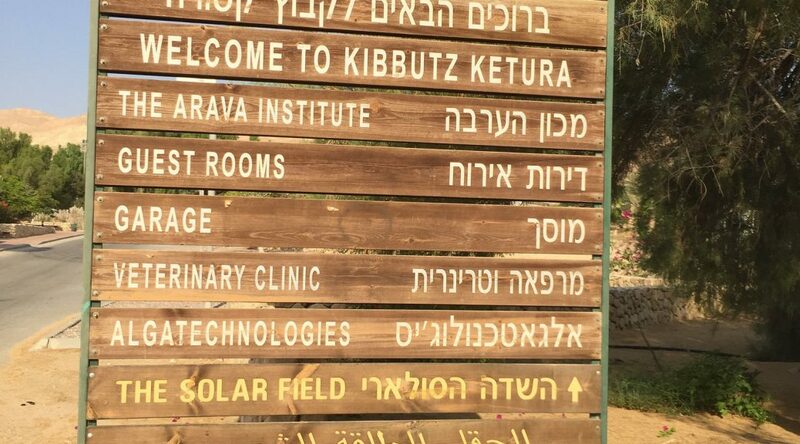 Next week, keep following our adventure for thoughts about Kibbutz Ketura, the Arava Institute for Environmental Studies, and various other things that fall on our minds.